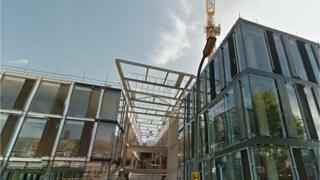 Council staff say they are having to work in "overcrowded" conditions due to delays moving into a new head office. Northamptonshire County Council's new Angel Square complex was due to completed in October with all staff moved in by the end of 2016. Many workers have already had to move out of the current HQ and into other offices around the county while the new building is completed. Unison said the delays were causing "high levels of anxiety and stress". The council says staff will start moving into Angel Square in Northampton in the last two weeks of April, but the move will not be completed until May. Existing HQ John Dryden House needs to be vacated by the end of March as it has been sold. Last month it was revealed staff had been told to work either in a library or from home, leading to concerns over confidentiality for people working in fields like social services. One county council worker said as many as 300 people were currently working from home. Unison said some people were working two to a desk, while boxes lying around the present offices were creating health and safety concerns and accessibility difficulties, particularly for disabled staff. Ben King, the local branch's health and safety officer, said workers were facing two moves - from John Dryden House to smaller council buildings and later Angel Square. "Some teams are working better than others via rota systems, but it has felt chaotic," he said. "There is a wartime spirit with people making a laugh and a joke out of it. "But work has backed up and some colleagues are saying they can make do temporarily, but not in the long term." A county council spokesman said moving more than 2,000 staff out of 12 buildings into the new building "is no easy task," but "there is a growing sense of excitement" about the move. He said there was no set number of people working from home, but there had been "an accelerated need for flexible working".